Boris Spassky was born in the Soviet Union in 1937. He was the reigning World Chess Champion from 1969 (when he defeated Tigran Petrosyan) until 1972 (when he was defeated by Bobby Fischer). Boris Spassky beat World Champion Mikhail Botvinnik in an exhibition at the age of ten, became International Master at age 16 and International Grandmaster at age 18. He qualified for this first Candidates Tournament when he was 20 years old, and won his first USSR Championship four years later. Boris Spassky moved settled down outside Paris with his third wife in the 1970s. He has been a French citizen since 1978. 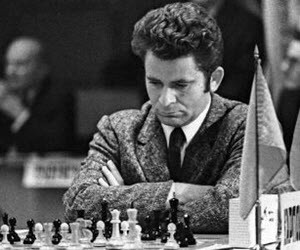 Boris Vasilyevich Spassky was born in Leningrad (today known as St Petersburg) in the Soviet Union on January 30, 1937. In 1942, the Spassky family fled their hometown because of the Nazi siege. Young Boris learned to play chess while on a train. The family eventually settled down in Kirov, but life there was hard for them. Boris kept on playing chess, and at the tender age of 10 he managed to defeat World Champion Mikhail Botvinnik in an exhibition. In 1953, the 16 year old Spassky had great success in a tournament in Bucharest, Romania, and earned the rank of International Master. In 1955, Spassky won the World Junior Chess Championship in Antwerp, Belgium. At just 18 years old, he was now a record-breakingly young an International Grandmaster. The year after his victory in Antwerp, Spassky qualified for this first Candidates Tournament. However, trying to keep up with both chess and his studies at the Leningrad University proved difficult for him, and he was also a struggling with a bad marriage. For several years, Spassky was no longer at the top of this game, and his results were dropping. In 1961, Spassky divorces his wife and broke with his trainer. With a newfound energy for chess, he was soon back in the top international field. He won his first USSR Championships that very year, and by 1965 Spassky was back in the Candidates Tournament. By now, his game was all-around strong, and he excelled in both aggressive attacks and patient waiting games. Boris Spassky’s first attempt to challenge the World Chess Champion for the title took place in 1966, where he lost to defending champion Tigran Petrosyan. Three years later, Spassky had a new chance, and now he managed to defeat Petrosyan and become the 10th World Chess Champion. Spassky kept the tittle until 1972, when he was defeated by Bobby Fischer in Reykjavik, Iceland. For several years, Spassky continued to be one of the top international chess players. He took part in several Candidates Tournament, and won the 1973 Soviet Championship. By the late 1980’s, Spassky had lost some of this steam. In 1992, he participated in a highly publicized match against Bobby Fischer in Yugoslavia and lost. A mild stroke in 2006 was followed by a more serious one four year later, one that left Spassky paralyzed on his left side and required extensive rehabilitation.